The skin-care products you are mostly likely to find in a skier’s possession involve water-repellency, glide-improvement, glop-reduction, and long-term storage. This skin product, however, isn’t for your climbing skins but rather is formulated for your epidermis. Dermatone Skin Protector protects your mug from the elements, so you can nail that Instagram shot without excess risk of frostbite or skin-cancer. 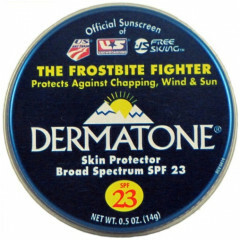 Frostbite, chapping, wind, and sun are no match for the official skin protection of the US Ski Team. If you look good, you feel good. If you feel good, you ski good. If you ski good, you grammar good. Half-ounce of “Frostbite-fighter” held in a screw-top tin. Dab onto your nose and cheeks when wind chill is a factor. SPF 23 means it’s the Michael Jordan of sunscreen. This stuff is absolutely magical for preventing frostbite. (And with a very prominent nose, I consider myself a leading authority on such matters!) But with enough Dermatone, I can skip something like a Buff even down to absurdly low windchills. Just one caveat: I've found the screws on the container easy to cross thread with cold number fingers. So instead I keep my Dermatone for the field in one half of a contact lens container (with sunblock in the other half).